Dr. John George Johannes was born in Bavaria, Germany on July 16, 1829. He was the son of John George and Christina Roesner Johannes. He received his education in schools of Germany and in 1849 he immigrated to the U.S. settling first in Fort Wayne, Indiana where he attended the Lutheran College, perfecting himself in the English language and studying medicine with one of the professors who was of the Homeopathic School. 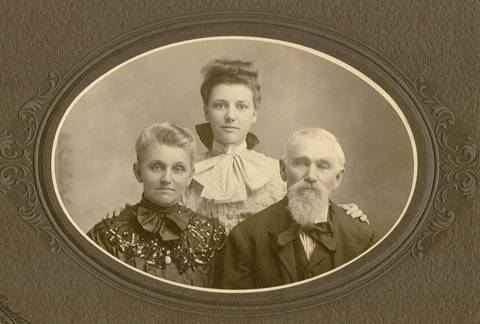 On December 7, 1851 he married Babeth Eideloth in Logansport, Cass County, Indiana. Babeth was born October 2, 1828 in Kronach, Bavaria, Germany. She is the sister of Agnes who married John’s brother, Erhardt. In 1852 he moved to St. Louis, Missouri where he worked in a store for 18 months. He then went to Benton, County, Missouri where he bought a land claim and entered 80 acres of land. With the outbreak of the Civil War he went to Allen County, Kansas and bought a farm there. He then returned to Benton County, Missouri to move his family to Kansas. Instead, he volunteered in the Union Volunteer Militia (Benton County Home Guards). He was a private in Company A. His brothers also served. He soon found himself in the Battle of Cole Camp on June 19, 1861. He was severely wounded during the fighting and taken prisoner. He was paroled by Missouri Governor Jackson and returned to Allen County, Kansas with his family on August 19, 1862, then lived in Osage township. He received a pension for his service beginning in 1877. He took up the practice of medicine which he followed until his death. In May, 1866, he sold the Kansas farm and the Benton County farm and came to Bates County, Missouri where he settled on a farm near Prairie City. He built the first home in the town and proceeded to practice medicine there. John and Babeth moved to Ransom, Kansas and she died there on September 27, 1905. He died there on March 22, 1918. Both are buried in Prairie City, Cemetery. At the time he died, he owned 500 acres of land. Erhardt George Johannes born Sept 15, 1852 and died June 8, 1895 in Schell City, Missouri. He was married to Katherine Herbert on February 20, 1876. William Henry (Wilhelm Heinrich) Johannes was born September 12, 1854 and died April 10, 1921. He married Amelia Konrad (Conrad) on January 22, 1878. She was born in 1858 in Ohio. Her parents were both born in Germany. They moved to St. Louis, Missouri to live. They were married for 20 years and had 8 children. Leonard Fredrick Albrecht (known as Albrecht) was born February 8, 1861 in Benton County, Missouri and died on March 22, 1931. He married Lizzie Amstutz on February 21, 1893. She was the daughter of Ulrich and Mariam Amstutz. Christopher J. Johannes born March 7, 1863 in Kansas and died November 6, 1947. He married Eva Knott, the daughter of George Knott. John Frederick Johannes who was born January 30, 1871. He married Mattie Lynch on October 2, 1895. Agnes Magdalene Johannes born March 28, 1865.in Kansas She married John Seelinger on January 26, 1881. Caroline Babeth Johannes born October 20, 1867 in Bates County, Missouri who married Albert Colfax Tilley on November 11, 1890. They lived in Ransom, Kansas. Dr. John Johannes, who was formerly a resident of Bates County, died Friday at the home of his son, Albert Johannes, in Ransom, Kansas, according to a telegram received by his grandchildren here. At the close of the Civil War, he engaged in the mercantile business in Rockville in the firm of Johannes Brothers, and could tell many interesting tales of pioneer days when the only way of transporting their merchandise was by wagons from Pleasant Hill. For many years his home was in Prairie Township. In the late ‘80’s he, with several of his sons, settled in western Kansas. He was quite well known here, having visited often in the home of his son-in-law, John Seelinger. Dr. Johannes was a man of splendid education, having graduated from an eastern university in theology and later earning his degree as a doctor of medicine. He was a brother of N. Johannes, president of the Johannes & Sons Implement Co., of Nevada and Lamar. His grandchildren of this city are Mrs. Roy Bartlett, Mrs. C.A.A. Sleeth and Mrs. W.W. Rubel.